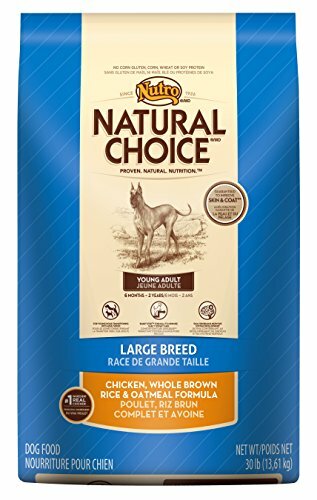 NATURAL CHOICE Young Adult Large Breed Chicken, Whole Brown Rice and Oatmeal Formula, 30 lbs. NATURAL CHOICE Large Breed Dry Dog Food – Chicken A large breed dog has different nutritional needs than smaller breeds. That’s why NATURAL CHOICE Large Breed Dry Dog Food is made with real, great-tasting chicken as its #1 ingredient to help build muscle and maintain a healthy metabolism. It is also made with naturally sourced glucosamine and chondroitin to help develop strong, healthy joints and farm-raised chicken to build muscle and maintain a healthy metabolism.. Formulated with optimal levels of omega-6 fatty acid (linoleic acid) and zinc, pet parents will love their big dog’s healthy skin and soft, shiny coat. Feed Them our Natural Dog Food from Puppy to Senior Years With a variety of products available, you can feed your pet NATURAL CHOICE Large Breed Chicken Dry Dog Food for years. Pet parents can even give their pet the large breed natural dog food for young adults to help them transition from puppy to adult as they continue to grow. NATURAL CHOICE Large Breed Dry Dog Food formulas also include these key benefits: • Real protein as the #1 ingredient • Healthy brain development • Strong, healthy joints • A guaranteed healthy skin and soft, shiny coat Available Varieties • NATURAL CHOICE Large Breed Chicken, Whole Brown Rice & Oatmeal Formula Dry Puppy Food • NATURAL CHOICE Young Adult Large Breed Chicken, Whole Brown Rice & Oatmeal Formula Dry Dog Food • NATURAL CHOICE Adult Large Breed Chicken, Whole Brown Rice & Oatmeal Formula Dry Dog Food • NATURAL CHOICE Large Breed Chicken, Whole Brown Rice & Oatmeal Formula Dry Senior Dog Food Available Sizes • 15-pound bag • 30-pound bag click to view product NATURAL CHOICE WHOLESOME ESSENTIALS Dry Dog Food NATURAL CHOICE WHOLESOME ESSENTIALS dog food holds the key to a balanced diet: a dry food with the #1 ingredient of great tasting, farm-raised chicken and oatmeal for sensitive stomachs. click to view product NATURAL CHOICE Large Breed Canned Dog Food NATURAL CHOICE Large Breed Canned Dog Food offers a delicious meal made from premium, natural* ingredients specifically tailored to your large breed dog’s nutritional needs. *with vitamins, minerals and other nutrients click to view product NATURAL CHOICE Limited Ingredient Diet Dry Dog Food Utilizing a select number of ingredients, NATURAL CHOICE Limited Ingredient Diet Dry Dog Food is made with real lamb and formulated with fewer ingredients to minimize food sensitivities. click to view product NATURAL CHOICE Dog Biscuits - Chicken NATURAL CHOICE Chicken Dog Biscuits are made with real chicken to support lean muscle development and mobility. Reward your dog with an all-natural treat they’ll love. Nutro Natural Choice Young Adult Chicken, Whole Brown Rice And Oatmeal Dry Dog Food, 15 Lbs. NATURAL CHOICE WHOLESOME ESSENTIALS Dry Dog FoodWith the #1 ingredient of great-tasting, farm-raised chicken, NATURAL CHOICE WHOLESOME ESSENTIALS Dry Dog Food contains the necessary amino acids dogs need to build muscle and maintain a healthy metabolism. Whole grains are added to the natural dog food to improve nutrient absorption and digestion. Help Support Your Dog’s Immune System with Our Natural* Dog Food *with vitamins, minerals and other nutrients NATURAL CHOICE WHOLESOME ESSENTIALS Dry Dog Food has antioxidants, mixed right in for a healthy immune system. This dry dog food formula also contains these great health benefits: • Real chicken is our #1 ingredient • Oatmeal helps ease digestion for dogs with sensitive stomachs • Guaranteed to improve skin & coat Available Varieties • NATURAL CHOICE WHOLESOME ESSENTIALS Chicken, Whole Brown Rice & Oatmeal Formula Dry Puppy Food • NATURAL CHOICE WHOLESOME ESSENTIALS Young Adult Chicken, Whole Brown Rice & Oatmeal Formula Dry Dog Food • NATURAL CHOICE WHOLESOME ESSENTIALS Adult Chicken, Whole Brown Rice & Oatmeal Formula Dry Dog Food Available Sizes (varies by formula) • 5-pound bag • 15-pound bag • 30-pound bag click to view product NATURAL CHOICE WHOLESOME ESSENTIALS Canned Dog Food NATURAL CHOICE WHOLESOME ESSENTIALS Canned Dog Food contains optimal levels of linoleic acid and zinc for a healthy skin and coat. These formulas also include the necessary amino acids dogs need to build muscle and maintain a healthy metabolism. click to view product NATURAL CHOICE Sensitive Skin & Stomach Dry Dog Food NATURAL CHOICE Sensitive Skin & Stomach Dry Dog Food contains no corn or wheat, which are ingredients that may aggravate food sensitivities in some dogs. Our formula uses natural*, premium ingredients that are easy for dogs with sensitive stomachs to digest. click to view product NATURAL CHOICE Limited Ingredient Diet Dry Dog Food Utilizing a select number of ingredients, NATURAL CHOICE Limited Ingredient Diet Dry Dog Food is formulated with fewer ingredients to minimize food sensitivity. click to view product NATURAL CHOICE Dog Biscuits – Health Benefits NATURAL CHOICE Dog Biscuits come in a variety of special formulations which cater to dogs that may need treats that support specific health benefits. 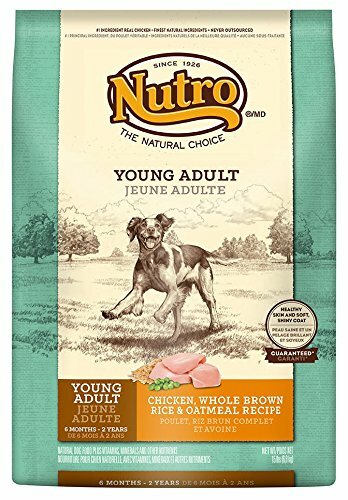 Nutro Young Adult Dry Dog Food, Chicken, Brown Rice And Oatmeal, 15 Lbs. Dogs between the ages of 6 months and 2 years old might look full-grown, but they still need nutrients for development — without the extra calories that lead to early weight gain. NUTRO Wholesome Essentials Young Adult Dog Food ensures dogs get the natural nutrition they need for proper development of the brain and nervous system and strong, healthy bones. 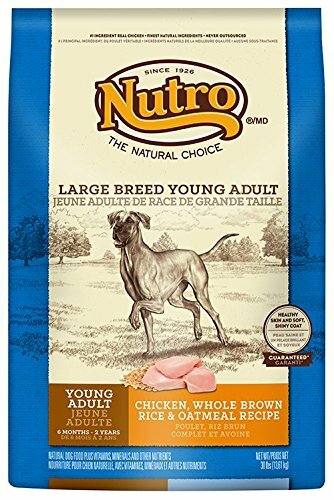 Nutro Large Breed Young Adult Chicken, Whole Brown Rice And Oatmeal Dog Food, 30 Lbs. Large breed dogs between the ages of 6 months and 2 years need targeted nutrition as they grow. NUTRO is the first pet food company to offer natural dog food just for young adult dogs. This large breed young adult dog food is made with real chicken to help build strong muscles, DHA for healthy brain and nervous system development, plus naturally-sourced glucosamine and chondroitin for healthy joints. Best of all, the NUTRO Smart Step Formula offers optimal nutrition without the added calories that might lead to early weight gain. Help your large breed dog transition from puppy to adulthood while staying lean and strong.